An accountability court on Saturday conceded the National Accountability Bureau (NAB) a 10-day physical remand of previous Punjab Chief Minister and Pakistan Muslim League-Nawaz (PML-N) President Shehbaz Sharif in the Ahsiana Iqbal Housing Scheme case. The pioneer of the opposition in the National Assembly, who was captured by NAB on Friday in the Ashiana Iqbal Housing Scheme case, was delivered under the steady gaze of accountability court Judge Najmul Hasan. 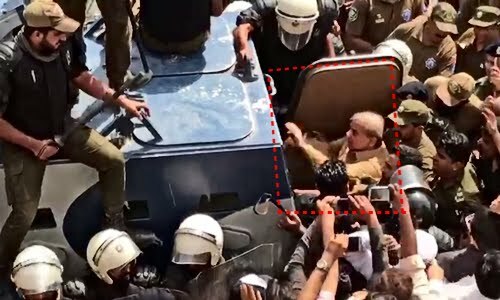 At the point when Judge Hasan started hearing the case in his chambers, the NAB investigator asked for that Shehbaz be sent on a 15-day physical remand. "Shehbaz cancelled the contract awarded to M/s Ch A Latif & Sons for infrastructure development of Ashiana Iqbal Housing Project and awarded it to CASA Developers," the NAB prosecutor upheld. "The former Punjab chief minister misused his powers and his actions caused a huge loss to the national exchequer," the NAB prosecutor told the accountability court judge. "Shehbaz needs to be further investigated in the case and should be sent on a 15-day physical remand," he added. Notwithstanding, Shehbaz denied the charges as "false and baseless" and his insight contradicted the NAB examiner's demand to send him on a physical remand. The pioneer of the opposition in NA then asked for that the hearing not be held in the chambers following which Judge Hasan continued it in the open court. Shehbaz told the court that the case against him "was made on political basis". "I saved billions through intervention in a personal capacity," he said while rejecting NAB claims that he cause a huge loss to the national exchequer. "I saved Rs75 billion in Orange Line Train project." "I sacrificed my sleep and health to work day and night in order to serve the nation," the former Punjab chief minister further said. The PML-N president asserted, "I have not done corruption worth a single penny." In the wake of hearing the contentions, the court saved its judgment on NAB's request for Shehbaz's 15-day physical remand. The court then conceded NAB a 10-day physical remand of the pioneer of the opposition in NA. Shehbaz will be created under the watchful eye of the accountability court again on October 16 (Tuesday).